Those who know me well know how much I love prawns. I can never say no to prawns. No matter how they are cooked I would eat them (of course not when paired with non-halal stuff) Even if it is very spicy, I will wash it and eat. LOL. I am not joking. That's how much I love prawns. Prawn pulao is one of easiest rice preparations made using prawns. 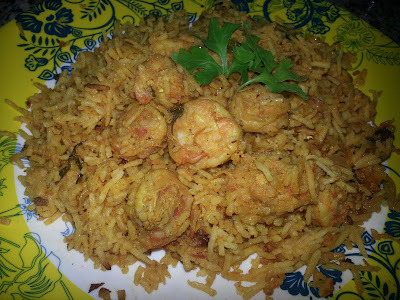 My husband who dislikes sea food and does not eat prawns eats the rice from this pulao and sometimes even eats just 1 or 2 prawns. 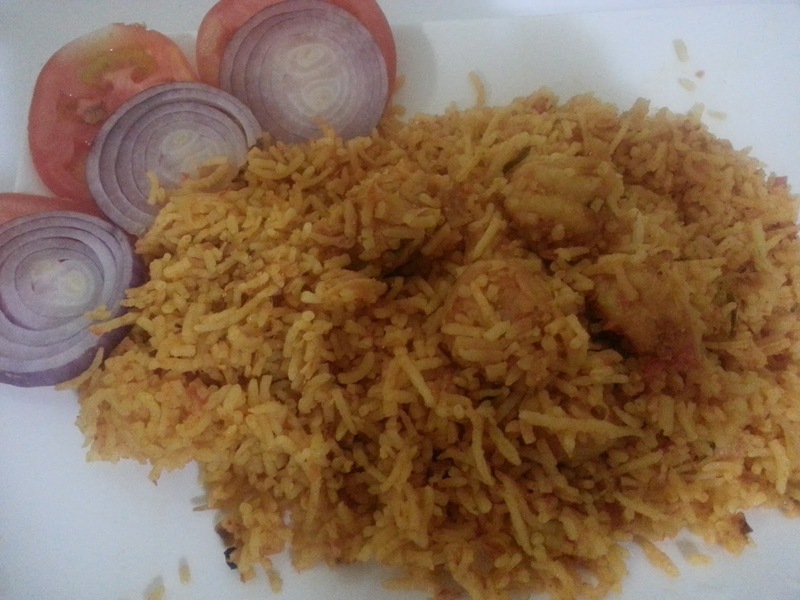 He insists that I should prepare mutton and chicken pulao in the same way. I tell him that it is the prawns that make the difference in the taste but he doesn't believe me till date. He has even seen me prepare this pulao but still thinks it is something else other than the prawns that makes the difference in the taste. Just like fish and prawn biryani taste better than mutton or chicken biryani, the prawn pulao also tastes better than mutton or chicken pulaos. 1. Wash, soak and cook rice till it is 3/4th done and keep it aside. I cook rice by adding it to boiling water with salt and some oil and draining the water once rice is done. 2. In a cooking vessel heat oil. Add clove and cinnamon. 3. Add the sliced onions and green chilli if using. 4. Fry till the onion turns translucent. 5. Add the washed prawns without any water and mix well. 6. Fry for a minute then add ginger garlic paste. 7. Fry for about 2 minutes. Then add salt, turmeric powder, chilli powder and coriander powder and mix well. 8. After a minute add the chopped tomatoes and cook for 2-3 minutes. 9. Add the yogurt and let it cook over low flame for 10-15 minutes. Add some water if required. 10. Add the coriander leaves. 12. Let the gravy cook to the consistency of a thick gravy so that the rice when added turns into a pulao without being soggy. 13. Add the cooked rice and mix gently without breaking the rice. 14. Cover and cook on very low flame for about 10 minutes till there is piping hot steam. 1. I even make this in rice cooker. After the gravy is cooked, I add uncooked rice with water in the ratio of 1:1.5 and add some salt, mix this to the gravy and cook in the rice cooker.